1.) Combine hoisin sauce, garlic, sesame oil, pepper, 1/4 cup of the pomegranate juice, and 2 tbsp of ginger in a bowl. 2.) Add the steak to the mixture and let marinate for at least 15 minutes. 3.) For Wasabi Cucumbers, combine wasabi and remaining 1 tsp pomegranate juice in bowl; add cucumbers; toss to coat, then refrigerate. 4.) To make Gingered Carrots, mix mayo and remaining 1/2 tbsp ginger. Add carrots; toss to coat, then refrigerate. 5.) When ready to eat, grill steaks. 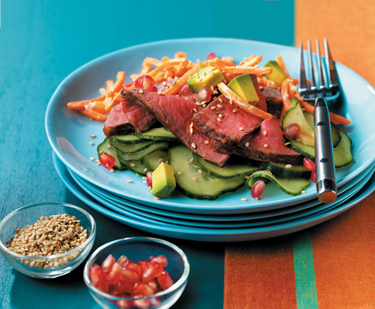 Slice the cooked meat thin and serve over cucumbers and carrots. Top with avocado, pomegranate and sesame seeds. — Can’t find hoisin sauce? Swap in soy sauce spiked with ginger or chili pepper — whatever you like to give the meat some extra bite.